Bansko ski and snowboard hire and ski school and lessons special offer from Bansko Blog has arrived. A massive saving off skimania in resort prices. Register for newsletter, check your email. New Salomon, Rossignol, Head, Volkl, Hart and WhiteDot skis. 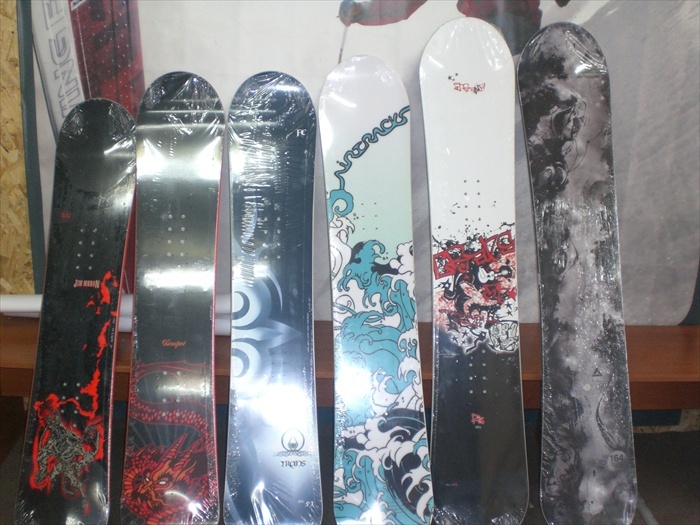 Snowboards and VIP snowboards are also now ready for hire. 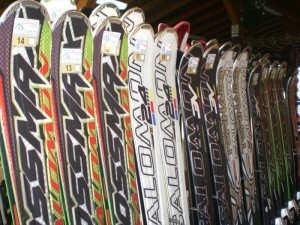 All have been taken delivery by George at BanskoSkiMania for 2011/2012 ski season. Two shops one just 50m from entrance (see live web cam for position). It’s opposite the Happy End apres ski bar and club. The same friendly welcome, flexible “day before hire” pick up, ski/board/boot FREE storage, ski/board servicing included plus the all important small class sizes. Testimonials in You Say section. More reasons to book quality hire and lessons are on the dedicated ski hire and lessons page here. This year there are brand new VIP Salomon Race 2V and 3V and Tornado VIP skis and Burton snowboards. All highly recommended for experienced skiers and snowboarders. Twin Tips (For fun park and tricks) Salomon Thruster and Ten Eighty and All Mountain Skis (for off and on piste) Salomon XWing and Atomic models. You choose which model on arrival, but then if you fancy a change then you get a FREE swap of skis or board (subject to availability) to suit you and the day’s conditions. A fresh dump of snow could give you bragging rights over your mates — as you head out with the right skis for the conditions. Such flexibility you would expect to pay a huge premium for. But for early booking with BanskoBlog, you still receive your discount and a price from just £8.15 (9.40 EUR) per day. If you want to make a huge step up in your ability this season, like I experienced last season, then think about booking private lessons. If you have been skiing or boarding for a few years now, and feel as if you have not progressed as much as you would have liked: or perhaps you struggle off piste or on hard packed or icy snow, then you will benefit from professional instruction. Why not book a private instructor for you and your friend(s)? It is one reason why so many come to Bansko and why they return. The guys and girls from the banskoskimania team are experienced for teaching beginners right up to seasoned experts (see You Say section) and from the youngest up to late starters. Excellent English is spoken by all instructors. All are fully qualified ski/board instructors; and all fully insured. Russian spoken by many instructors. Other languages, e.g Greek and French by request. Book today and be sure to reserve private and group lesson requirements. 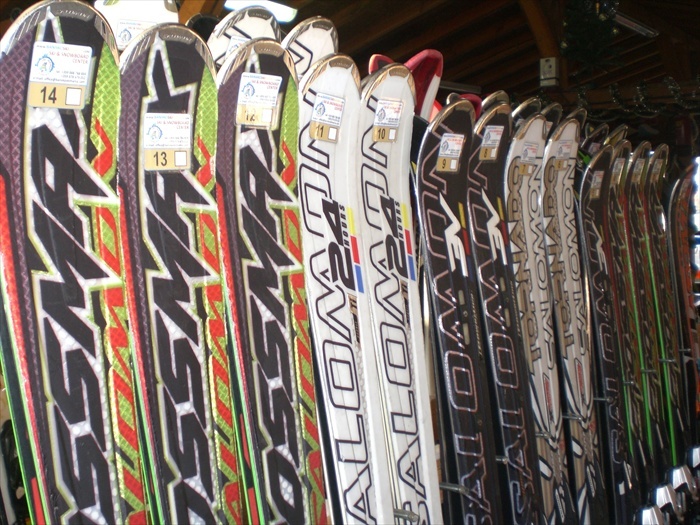 Click here for full ski hire page. 1. Register for newsletter on banskoblog: Enter your name and email on the right. (NOTE: I will NEVER sell or rent your email address — you can unsubscribe anytime). 2. Confirm your email address by clicking on the link that will receive in the email in your email inbox. 4. We confirm and send you a payment request for payment with credit/debit card via papal.com, as per instructions on your booking form. You do not need a PayPal account for this. Credit card details may be emailed and charged manually if you wish. Any questions, please email or call me. 5. Confirmation will be with you within three days. Relax… your ski and board hire & lessons, lift passes and transfers are booked. BanskoSkiMania are dedicated to quality service. This means small group class sizes. These are essential for your rapid and safe learning experience. Your vacation time is precious – don’t gamble on this holiday essential. “Hi Lance , Just a quick thank you for giving a full refund for the ski package I purchased from BanskoSkiMania*. Our flights were cancelled today which was bad enough but then being marooned and trying to get monies back from shuttle services , Easyjet etc. has been a nightmare! Your immediate refund was great news in what has been a horrible couple of days. Thanks Pete & Em” *Booked through BanskoBlog. Not Got A PayPal Account? It takes less than a minute to set one up. Go to PayPal.com; click on SIGN UP button for an account and you will join 230+million other people with paypal accounts. Most credit and debit cards cards are accepted. Paypal is safe, secure, and a very quick method of payment. If you do not have, or don’t want to register in PayPal, then simply email your credit card details with booking form. Please read this SKI PACKAGES page first, then FAQ’s. If you require a private instructor for two people second person for free. ; for three or four people add 50% to private instructor price. Contact me direct if your country (like Serbia) does not yet have PayPal. Children, under 10 should start skiing first rather than snowboarding. Adult helmets not provided — best purchased before arrival or in resort (shop next door has a huge range) for best fit and safety. Prepay for 6 days and 13 days only. They are delivered to the ski shop at 18:00 the day before hire. Gondola KIOSK. Open 08:30 to 17:30. A quick digital photo taken by kiosk staff for passes valid for two days plus. Buy winter sports insurance. EU reciprocal arrangements do not include all medical expenses and certainly not emergency repatriation. Lift pass insurance is not sufficient holiday cover. moneysavingexpert.com for best buys. Book winter short break flights now for March. Thessaloniki airport , in Greece and Plovdiv airport in Bulgaria could be good alternatives to Sofia airport. Make sure your apartment is insured. Every year apartments are damaged through leaks and burst pipes. Contact me for an insurance quote. Be sure to read the small print. Enquire for groups larger than 10, custom requirements, longer hire periods and total booking amounts more than €2,000 please contact. I am interested in pre-booking snowboard and boot hire for myself and my husband for 5 days from 28th December. Our two friends will also want to hire snowbaord and boots or skis and boots. Could you confirm that the price will be £44 per person for the 5 day boot and board hire/skis, boots,sticks? Also, are you able to tell me how much a 5 day lift pass is please? We would like to have a 2 hour snowboard lesson for the 4 of us- how much would that be and can we book in advance? Thank you for your comment and for subscribing to newsletter. Yes, you are correct — it is £44 for 5 day snowboard and boot hire. Four people in a pre book private lesson cost the price of one person at £33 one person private lesson rate + 50% is £49. Excellent value at £49. I just compared this price with prebook in Beaver Creek (in the US)… There 3 hours prepay is $510 so 2 hour equivalent is $340 around £216! Lift pass is $94 / day. Bansko Lift pass prices for 2011 are here: https://banskoblog.com/2010/12/bansko-lift-pass-pr…. We would like to have private ski lessons for our two daughters (aged 6 and 11). Could you confirm that the cost for lessons and ski hire for the two girls would be £128? We also need to hire equipment for my husband and myself – we have our own boots. Do you have prices for the lift pass? How do we go about booking? – we are arriving on the 23 December and leave on the 4th January, when would the best time to fit in a few days of skiing be? Also, if you are able to assist we fly into Thessaloniki on the 23rd December, are you able to offer transfers to Bansko for two adults two children? Thank you Cathy. Private lessons are okay for 24th and 25th, but after that we are fully booked most days until 8th January. We have group lessons still available. If you can fill the enquiry for on the contact page, then I will reply with all prices. For Thessaloniki transfer we can assist too! Thanks for commenting and look forward to seeing you in Bansko. Thanks for asking. Yes, Thessaloniki transfer is fine and I will send you all prices and info by email. Prices are on this page: https://banskoblog.com/lift-pass-ski-packs%E2%80%8… and on the form you receive after subscribing. Hi Lance, Can you please advise me if you offer transfers from Plovdiv airport? We are looking at 4 adults and one 8 year old, from 14th-21st Feb – also interested in ski hire and lift passes, can you please tell me if the lift pass prices on the site are in UK prices, or Bulgarian? Many thanks, Karen. PS – I am already sunscribed to your blog, have been for a year, finally hoping to get there! Hi Karen, please email me for a good transfer person i know for Plovdiv. Please go to Prices menu. Or you can add in your requirements by entering the info in the booking widget. Them, only should you decide to proceed click the submit button. We check your order. Then, within 48 hours, send you a payment request. Where can I hire ski pants & jacket?how much will it cost to hire both for 3 days? We want to ski at the end of the season, last week in March in to April – wil the lifts be open and are lessons available? Hi Mike, The lifts will be open. BUT as always and for any ski resort, lifts work when there is snow to ski on. So yes book lessons, ski hire but take out insurance that covers lift closure, just in case. Firstly I wanna say it is really perfect blog to learn about bansko. I want to ask about hiring we are four adult and two teenage and we want to hire two board and four ski sure with shoes what about the prices all of them? Do we have group discount what about? Me and a few friends are thinking of coming to Bansko the wkend after next. We have never been skiing and have none of the gear – clothes, skiis, shoes…basically we will need everything and then lessons. Pls could you advise the price for a complete package so we have everything we need?